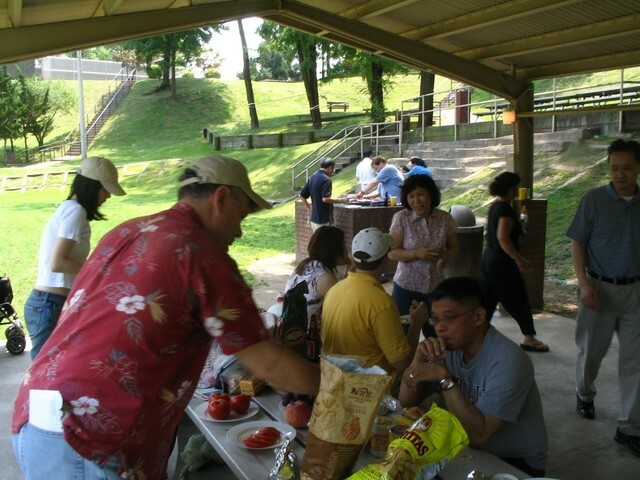 About 18 RAK members and their families came out to the first (most likely annual) RAK spring picnic. Thanks to all the RAK members who came and contributed something the cook-out. Special thanks go to George Geddes, who did his usual fine work at the grill. We had plenty for everyone and even had enough left over to share some with a group of elementary school girls who were having their own picnic on the same grounds. Republicans Abroad-Korea members getting ready to eat. Master Chief George Geddes is at the Grill. After eating (well, the first two rounds of eating), we got down to some business. RAK Chairman John Lee reported on his trip to the RA Asian regional meeting in Hong Kong a few weeks earlier. We also discussed our plans for voter registration this summer and fall. Republicans Abroad-Korea Chairman, John Lee (left) talks with RAK members. Having bellies full of meat (and, in some cases, beer) did not prevent a few of us some trying to show off our athletic prowess by playing a volleyball for an hour or so. The team of Peter Laver and Andy Jackson held their own against the power of Bob Gilbert and Manny Lee/George Geddes. In case anyone was wondering the grass stains came out of Andy's clothes pretty well with a little scrubbing. Of course, cigars were on hand (thanks once again to George). Cigars are always welcome at RAK events, except when they are not. I think we are looking at a pretty set schedule of RAK social events: Thanksgiving dinner, spring picnic and September picnic. We are also looking into doing some kind of sports challenge with the Democrats and/or Libertarians. Senator Lisa Murkowski visited Seoul today as part of a multi-nation tour of East Asia. Republicans Abroad-Korea tried to secure a meeting with Senator Murkowski but her extremely busy schedule precluded it. However, RAK's Executive Director Andy Jackson (me) was invited to a reception for Senator Murkowski at the Ambassador's residence. I would like to thank Isaac Edwards, Senator Murkowski's Legislative Director, for extending the invitation. RAK had its first (annual?) Thanksgiving dinner last Sunday, November 27 at the Hamilton Hotel in Itaewon, Seoul. About 25 members and guests came out. New RAK member Jenifer Sachse gave the invocation before we enjoyed turkey, ham, dressing and other traditional Thanksgiving food. Special guest Jae Ku from Freedom House gave a short talk about their activities in support of Seoul Summit: Promoting Human Rights in North Korea. RAK and Democrats Abroad-Korea are two of many cosponsors of the summit. Republicans Abroad Chairman John Y. Lee talking about his experience during the Korean war in November, 1950. RAK chairman John Lee then described how he spent November of 1950 during the Chosin Reservoir Campaign of the Korean War. He read some from a chapter in the book Breakout: The Chosin Reservoir Campaign which talked about his experiences. Special thanks go out to Bob Gilbert for ordering and picking up the food from Dragon hill Lodge, John Lee for securing the room at the Hamilton and George Geddes for organizing the set up. If I forgot someone, I thank you also. Thanks to the hard work of RAK members, the reception with Kang Chol-hwan on October 9 was a great success. About 136 people came out to the Seoul Club to Hear Kang speak on his struggles as a teenage political prisoner and his views on how to best deal with North Korea's appalling human rights record. The reception was jointly sponsored by Republicans Abroad-Korea and Democrats Abroad-Korea. "[The South Korean Government] should have asked for transparency in return for the food aid," Kang said in a speech to a crowd comprised largely of foreigners living in Seoul. "I have always been working to improve the human rights situation in North Korea since I arrived in the South. Since meeting President Bush, a lot more people are paying attention to what I have to say," Kang said. Those at the head table were; Kang, RAK Chairman John Lee, DAK Chairman Nate Hilts, RAK Executive Director Andy Jackson, Ambassador Tomas Smetanka of the Czech Republic, Political Counsellor Martin Quinn of the Australian Embassy, DAK Military Liaison Gene Gerth and Mr Kang's translator. A lot of members put in a great deal of work to make this a success: Carolyn Mosteller and Maria Brown handled the reception table (with some help from Kurt Mohay and DAK's Gene Gerth). George Geddes did a lot of work on coordinating with the Democrats and the host site. Mike Choi helped with getting our message out. I helped some too. The biggest thanks go out to the people who gave our event its two most essential elements. John Lee secured Kang Chol-hwan for the event and Bob Gilbert's work got us at least half of the 136 people who attended. While we are thanking people, we should express our gratitude to AMCHAM and the European Union Chamber of Commerce for letting us advertise to their members; Ambassador Smetanka, Martin Quinn and other members of the diplomatic community for coming and Ashley Cheeseman and his staff at Seoul Club for their work to make the event run smoothly. Thanks also to Democrats Abroad for agreeing to cosponsor the event. Chairman John Lee speaks to RAK members and guests. Chairman Lee gave special recognition to RAK members who made major contributions this year, including Kurt Mohay, Steve Carrol, Bob Gilbert, George Geddes, Evan and Virginia Roberts and Andy Jackson (me). Evan and Virgina Roberts were among about three dozen people who enjoyed the event. The Roberts are returning to America in a few weeks and will be missed. A view from the "Cigar Chomper's" corner. The signs on the walls were auctioned off at the end of the evening. I really enjoyed meeting with with RAK members and guests to celebrate our victory. I went to the Columbus Day event at the Yongsan Garrison on Saturday and got write-in ballots to 41 people. Special thanks go out to Bob Gilbert, who arranged for me to get a vendor's pass and who assisted some with the ballots, Doug Sheppard, who helped me get a better location (we had not paid for a tent and table) and the Royal Asiatic Society who later shared two of their tables with me under their tent. In keeping with tradition, while operating on base our efforts we non-partisan (other than a copy of Unfit for Command that I read when business was slow). I even had an opportunity to talk with a member of Democrats Abroad who came over for a visit. Towards the end of the day, Maria Brown came to the table, filled out the information on the ballot envelope and offered to get write-in ballots to about 25 other people on base. I know that she got those out because she needed about 20 more the next day (UPDATE: she has since gone through those 20). While I told people that they should fill in their ballots a home, a few went ahead and filled them in in front of me. I can happily report an early 'exit poll' of four votes for President Bush and none for the other candidates. Sunday, October 10 Several RAK members gathered in front of the Hamilton Shopping Center in Itaewon, Seoul to distribute write-in ballots for about two hours on Sunday. We got write-in ballots to over forty people. Special thanks go out to Virginia Roberts and Kurt Mohay, who did the bulk of the work. RAK member George Geddes helps people register to vote. 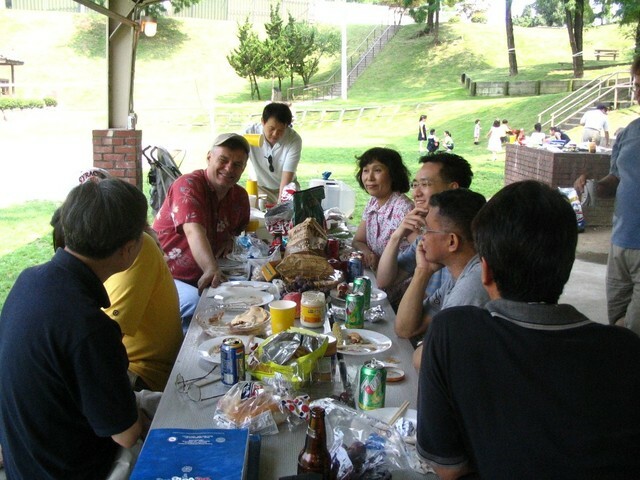 Republicans sponsored a voter registration table at the 2004 Labor Day Block Party at the Yongsan Garrison in Seoul on Saturday, September 4. Although foot traffic was not as heavy as we would have hoped for, we still helped over 70 people register to vote. We also gave a federal write-in ballot to two soldiers who will be heading to Iraq soon. We hope to be able to register people on several bases next weekend but that is not likely. Military officials have been hesitant to allow outside groups to work on base. In fact, we only got the table on Labor Day weekend because we paid for a sponsorship. Thanks to the RAK volunteers who helped make our block party event a success. I came across this article from MSNBC which talks about the hard work that campaign staff in Iowa do. That brought back memories of my own campaign experience in Iowa back in 1996. I was the Political Coordinator for the Alan Keyes for President campaign. I felt the same way, except we didn't have enough money for an office down town. Our office was almost in Urbana (I think that is the name of the town). That lack of money and the fact that we were competing with Pat Buchanan for the same voters made my job very difficult. There were two full-time staffers in Iowa. One to raise money (unlike most campaigns, we paid for almost everything with locally-raised money) and one to get votes. I was the vote guy. My main job was to provide support to our grass-roots organizations across the state. I also handled scheduling for candidate visits but rarely went on the road with Alan because I had to hold the fort in Des Moines. I was at this rally. We had a great organization in Cedar Rapids (Linn County). Alan was rarely happy the few times I did see him. I always scheduled him very tightly whenever he came to the state. That, combined with his tendency to speak longer that planned for, meant that he was always running late. At least once he felt the need to remind me that he was not a machine. One time I did hit the road with him was in the last few weeks before the caucuses. We got a couple of other staffers to man HQ so I got in an RV with Alan, another staffer and one reporter. The the heater in the RV was no match for the -5 to-30 temperatures so we had to rap Alan up in a blanket or two as we went from event to event. It was a tough campaign. We didn't have enough resources, we were competing with a more established candidate for the same voters and I made some rookie mistakes. We only pulled in 8% (our goal was 10%) and I left the campaign a few weeks later to start making my student loan payments. But I will always remember our putting up the good fight against the odds.